1" Two Color Print Lanyard. Dye-Sublimated, two color, two sided printing can contain an two colors for the logo or text design and we do not charge setup fees if we use your vector artwork. Also available with a safety breakaway joint for easy adjustability. Note: All of our dye sublimation lanyard fabrics are white, so the design color white does not count as a color charge in your price quote. Our 1" dye-sublimated lanyards are the highest quality printed lanyards available on the market today. Long-lasting image transfer technology makes sure that your colors stay bright day-in and day-out. Choose from an array of attachments ranging from durable nickel plated steel to versatile plastic. 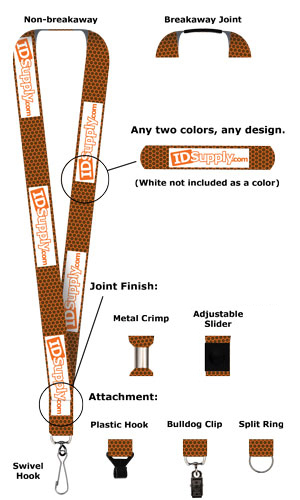 Dye-sublimated lanyards offer maximum customization with the ability to have intricate designs. If you can design it, we can print it! Your custom designed image prints edge-to-edge in full vivid color. Make your image stand out with a lanyard you’ll be proud of. Made of an ultra-soft polyester material, our dye-sublimated lanyards are smooth to the touch and comfortable to wear. We offer an optional breakaway joint with a slider that can be adjusted for comfort.